I find it both exhilarating and startling that the art form know as the Great American Comic Strip is perhaps hotter than ever. How did this happen? Is it just all of us aging boomers looking back? Are we having an impact on some of the youngsters out there? I mean, Guys! 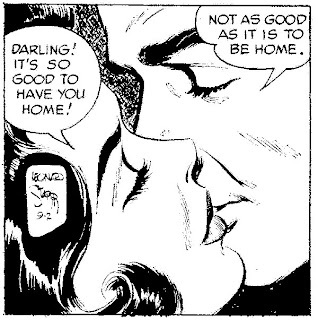 We are finally going to see a full run of Alex Raymond's Rip Kirby in fine fashion from Dean Mullaney and IDW. Thank you Dean!!! And now Sam's Strip from Fantagraphics, a redo of Prince Valiant. Buck Rogers, and The Phantom from Hermes. As a local DJ in Chicago likes to declare: "It's great to be alive!" I, like most in the independent book field, have a day job. On the publication of On Stage volume 1, I gave a copy to our young Administrative Assistant. A couple of days later she came into work, walked into my office and declared - "You know that Leonard Starr? He is a genius! I never knew comic strips could be that good!" Another time - I was sitting next to Lon Allen at the Eisner Awards in 2007. Some Jim Morrison type by the name of Paul Pope was on stage, reading off the nominations for best archival edition, while I tried to act cool as he continued to read. When he got to Mary, he actually said '...and my own personal favorite Leonard Starr's Mary Perkins On Stage.' Hot damn! Of course we, didn't win. An honor to be nominated, right? And anyway - Who needs to win an Eisner when folks like Paul Pope, Maggie Thompson, Walt Simonson, Howard Chaykin, Eddie Campbell, Jim Steranko, and the like are really getting into what you're doing? Just makes me want to do even more. A couple of weeks ago I got an email from someone in Sweden who was worried that Classic Comics Press might not make it in these troubling times. Honestly who knows for sure? Times are indeed tough, sales are steady but slow, bills are due, strips need to be scanned, rights have to be looked into, and each night I pray to the computer gods that Vista doesn't crash while I'm cleaning up a particularly nasty clipping, trying to figure out how good it'll look in print. Thank god there 's guys like you doing what you're doing. The work deserves a new audience. P.S. the website looks great.